Today is a sad day in the Village of Williamsville. Larry, the homeless wonder, was found in a bus shelter from apparently freezing to death. 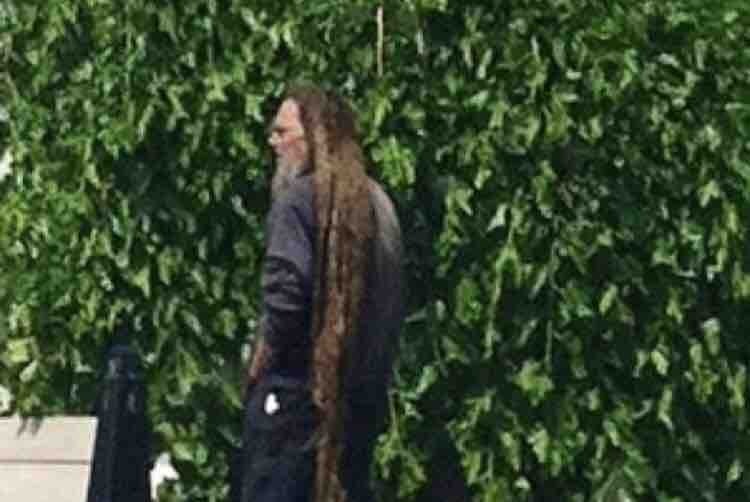 As many of you know; Larry has been in our area for as long as we can remember. He was quiet man with many different stories about his life who never caused any trouble. So many strangers and local business’s supported him by offering him meals, spare change & a safe place to sleep at night. 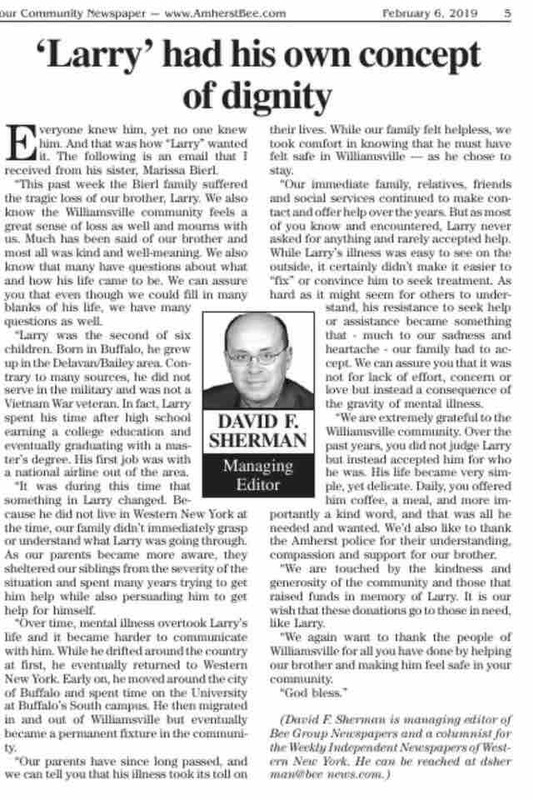 He never expected a thing from anyone & will forever be remembered as a legend in Williamsville. Please join us in giving Larry a proper memorial. 100% of the proceeds will go towards this campaign & any leftover funds will be donated to a local charity. It takes a Village” Thank you so much for your support! Happy National Random Acts of Kindness Day! What better way to celebrate than share with y’all what we have chosen to do with your generous donations. It will be aired on Channel 2, WGRZ News as well ❤️ Thank you all once again!! A homeless man whom many in Williamsville knew only by his first name sadly passed away in January during a blizzard. Although he rarely spoke so many of us respected him, offered him unsolicited assistance and never questioned the choices he made. We raised $8,130 in just 24 hours from 310 kind hearted people who donated to our campaign! We were overwhelmed and blessed with the outpouring of support! The saying “It Takes a Village” best describes how our Community reacted. Because of this man, we are now ALL aware of what must be done during harsh weather to protect all who are in need. Quoted from an article the family published “We are extremely grateful to the Williamsville Community. Over the past years, you did not judge, but instead accepted him for who he was. His life became very simple, yet delicate”. It is their wish that the donations go to those in need. After careful consideration we have chosen “Friends of Night People” to receive the entire donation of $8,130 to distribute among the various community meal sites and programs they run for so many delicate people. Their mission is to provide food and necessities and to address the effects and impact of poverty. Those who come for meals all have different stories; whether it’s rebuilding their lives after loosing a job or housing, exiting prison, dealing with deep family issues, or being crippled by mental health or addiction. At Friends of Night People and their partner sites, each person is welcomed with empathy, compassion and the desire to help. Joseph Heary, Executive Director at Friends of Night People said this: “The common denominator of all our programs, and so many others who work with our organization to impact these issues is the hot meal served nightly with respect, dignity and compassion by our volunteers. This gift will be used to create community awareness and provide assistance to individuals in need. It will help our ability to access individuals in need and connect those individuals with the help that is available at our organization and in our Community”. On behalf of myself, my co-coordinator and long time friend Matt Webb, we would like to thank each and everyone of you for your generous donations and kind words. Our hope is by bringing awareness to the forefront today, our Community will continue to help those in need. Everyday should be National Random Acts Of Kindness Day!